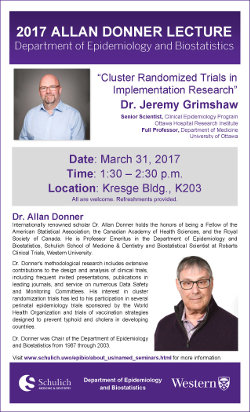 The 2017 Allan Donner Lecture: "Cluster Randomized Trials in Implementation Research"
Dr. Jeremy Grimshaw received a MBChB from the University of Edinburgh, UK. He trained as a family physician prior to undertaking a PhD in health services research at the University of Aberdeen. He moved to Canada in 2002. His research focuses on the evaluation of interventions to disseminate and implement evidence-based practice. Jeremy is: a Senior Scientist in the Clinical Epidemiology Program, Ottawa Health Research Institute; a Full Professor in the Department of Medicine, University of Ottawa and a Tier 1 Canada Research Chair in Health Knowledge Transfer and Uptake. In 2015 he was elected co-chair of the Campbell Collaboration and became Corresponding Fellow of the Royal Society of Edinburgh. He was the Director of Cochrane Canada (2006-2015) and the Co-ordinating Editor of the Cochrane Effective Practice and Organisation of Care group (1997-2015).